Description: Sexes similar. 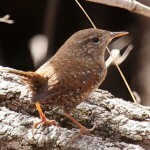 Dark rusty-brown above; warm buff below; white throat; two thin white wing bars; and prominent white eyeline. Behavior: Sings at any time of the day or year. 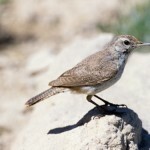 Habitat: Found in riverbottom forests, forest edges, cultivated areas with brush piles, and suburban parks and gardens. Where in Nebraska: Uncommon permanent resident in extreme southeastern Nebraska. Range contracts after severe winters, gradually expanding during a series of mild winters. 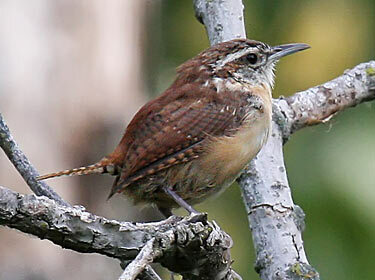 Fun Facts: Carolina Wrens form pair bonds at any point during the year and mate for life. They maintain and forage on territories together all year round.